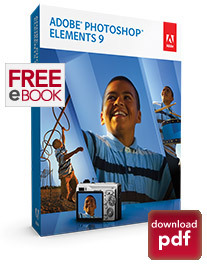 A special gift for our readers: For a limited time, we’re offering a download of the Adobe Photoshop Elements 9 Guide ebook, with 13 chapters and 95 pages of visual tutorials and feature how-to’s, completely free for personal use… And the vast majority of it will apply to the new Photoshop Elements 10 as well. This e-book is a great overview and introduction to PSE 9, and covers a lot of helpful material for getting started with the product or learning more skills if you’re already familiar. You won’t find this book anywhere else. The download is 4.7 MB in size, in PDF format (get the free and better Adobe Reader X, if you haven’t already). If you don’t yet own Photoshop Elements 9, just download the fully-working trial from Adobe to run it for free for 30 days. Much of the training in the book will be relevant for older and newer versions of PSE as well. If you currently have an older version of the software, you might be interested in a nice chart with the differences between Photoshop Elements 9 vs. 8 vs. 7 vs. 6. Or, if you also like to learn by video training, check out these four hours of free video tutorials for Photoshop Elements 9, or alternatively for Photoshop Elements 8 or 7. Here is the table of contents and chapter descriptions for the free book… enjoy it! This guide presents an overview of the Adobe Photoshop Elements 9 workspace including information on how to get started with Photoshop Elements 9. 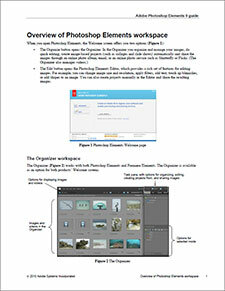 While in the Editor in Photoshop Elements 9, you can select an entire image or isolated parts of an image for editing. To select the entire image, use the commands in the Select menu. For more precise selections, you can choose from several selection tools in the toolbox. With the shape tools in Photoshop Elements 9, you can draw perfect geometric shapes, regardless of your artistic ability or illustration experience. The first step to drawing shapes is to select one of the six basic shape tools. You can add shapes to any file you can open in Photoshop Elements. You can make good photos look great with the editing tools in Adobe Photoshop Elements 9. You can easily rotate, straighten, crop, resize, and recompose images. Some of the tools for these basic edits are in the toolbox. If your photo requires more touch-up than you can achieve by using Quick Fix, you’re ready to use the photo retouching tools in Photoshop Elements 9. These include tools for removing small and large imperfections, eliminating distracting objects, cloning parts of an image, blurring and sharpening parts of an image, adjusting color and contrast, and a lot more. The focus of this guide is five of the photo retouching tools, including Spot Healing Brush, Healing Brush, Clone Stamp, Blur, and Sharpen. Adobe Photoshop Elements 9 has tools that let you automatically adjust the tonal range, color, and sharpness of your photos. You can also remove dust spots or other defects from your photos. You can accomplish these tasks in different modes, depending on your experience and needs. Using Smart Fix and the auto enhance commands to apply auto adjustments to color, contrast, lighting, and sharpness. Using the Quick Selection tool to make changes to image selections. Using the Photomerge Style Match to auto-apply an image style to another picture. You can use filters in Photoshop Elements 9 to change the look of your images. For example, you can apply special effects that turn an image into an artistic rendering of a photograph. You can apply filters to a selected area or to an entire layer. Not all filters work on all images. You can’t use some filters on images in grayscale mode or use any filters in bitmap mode or index color mode. Many other filters will not work on 16-bit images. Once you have applied a filter, you can continue to reapply it to increase the effect. Layers are like stacked transparent sheets on which you can paint or place images, shapes, or text. You can see through the transparent areas to the layers below. You can work on each layer independently, experimenting to create the effect you want. You can adjust a layer’s color and brightness, apply special effects, change its opacity, and change its stacking order. If you want to experiment with color, filters, or other adjustments, you can place an adjustment or fill layer above the image and see the affects without making any changes to the layer that contains your image. To remove the effects, simply delete the adjustment layer. You can add text to images in Photoshop Elements by using the Type tool. Once you add text, you can modify it by using the Type toolbar, by transforming the text box, and by applying layer styles to the text’s layer. This guide is a basic introduction to drawing. After learning the basics, you can experiment with brushes to find the settings that work for you. When drawing freehand, you may prefer to use a tablet and pen instead of a mouse. The Pencil tool paints the current foreground color of an image and creates hard-edged lines. The Brush tool paints the current foreground color on an image and creates soft strokes of color. The Pattern Stamp tool paints whatever you have currently selected in the pattern picker. Slide shows are a fun way to share your pictures. With Adobe Photoshop Elements 9, you can customize your slide shows with music, clip art, text, and voice narration in the Slide Show Editor. You can use your photos in creative projects, such as slide shows and photo books, and share them with family, friends, and colleagues. Once you finish editing your images or creating projects from these images, you can export images in formats for print (PDF) and the web (JPEG, GIF, or PNG). Plus: Over 1,000 pages of free downloadable CS6 ebooks, or a free 172-page “CS5 on Demand” ebook covering Photoshop, Dreamweaver, InDesign, Illustrator, and Flash Pro. Note: This complimentary ebook is for personal use only and not for redistribution. However, please feel free to link to or share this original page with whoever or however you like. this is really awesome of you. thanks. Thank you for the kind words – you’re all very welcome! Tried to download the free 95 page eBook on Adobe photoshop elements 9 unsuccessfully. It uploads the first two pages and I get an alert “cannot download page contact publisher” Please advise how to correct. Hi Sam, we had a problem with one of our servers earlier today, but it’s fixed and everything’s good now. Please try again, and if you still have difficulty for any reason, you might try a different browser, computer, and/or Internet connection… (avoid Wi-Fi for large downloads) Thanks! I own Dell XPS 17 (i7 RAM 8GB) and everything goes very quickly and without downtime. Thank you for your cooperation and Adobe has saved my pocket. Thank you, it helped me unlock the secrets of Photoshop without the frustration. Thank you for this eBook! This will be a huge help to me with APE9, which I bought just six weeks ago. Many thanks! You bet Tony – glad it will help! Thank you and GK both for your kind words, and please stop back any time. Yes indeed Manuel – and we hope it will help! Photoshop Elements 10 is also out now, and largely works the same for the major functions… You can read about the new features added. Thank you very much for providing these helpful e-books. Please provide e-books related to Adobe After Effects CS4, CS5 training, I want them a lot. Sure Rupinder – we don’t yet have an eBook for that, but these free After Effects tutorials should help. I am very happy for the free download ebook.